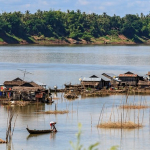 A Chinese-backed plan to build Cambodia’s biggest dam could “literally kill” the Mekong river, according to a confidential government assessment seen by the newspaper The Guardian, which says that the proposed site at Sambor is the “worst possible place” for hydropower. The newspaper article states that dire impacts are predicted on river dolphins and one of the world’s largest migrations of freshwater fish, which in turn affect the many fisher villages that depend upon this river basin. The Mekong sustains the livelihood of 60 million people and 80 per cent of Cambodians count on fish as their main source of protein.